LEGO Marvel Avengers (PS VITA) demo gameplay experience at E3 2015. Considering all LEGO games as a unique series, right now there on the market a series overexploited since arriving every year two or three releases, also they changed little formula each other. Without going too far, in 2014 we had The LEGO Movie Videogame, LEGO: The Hobbit and LEGO Batman 3: Beyond Gotham (plus some portable title as LEGO Ninjago: Nindroids ), and so far in 2015 we have been enjoying LEGO World Jurassic and are to come Dimensions LEGO and LEGO Marvel Avengers , and we also have good Worlds LEGO, the LEGO Minecraft, already in Steam’s early access, and has many similarities with other titles. The formula of the British TT Games is hugely successful, and sales, criticism and especially the public satisfaction guarantee, a style of play for all ages that can enjoy parents and children alike, with packed adventures content good taste and humor. One of the keys to success has been to make known sagas in cinematic LEGO figures, and from Star Wars to Harry Potter, Pirates of the Caribbean through and Indiana Jones, has always been a pleasure to relive these films from the particular perspective of video games LEGO. The other side just as entertaining is to convert the most popular superheroes in the world of comics in Lego toys, and if it first did with Batman and other DC Comics in 2013 could finally have the characters of the direct competition, in the great LEGO Marvel Super Heroes, a feast for lovers of characters like Iron Man, Spider-Man, Thor, The Incredible Hulk, Wolverine and some others, both villains as heroes, recreated with great care and affection. Now comes a continuation, LEGO Marvel Avengers , unlike what happened in LEGO Marvel Super Heroes, in which we had a completely original story that served as an excuse to mix all the Marvel characters, now will review faithfully the events in the two successful films of Joss Whedon: The Avengers (2012) and the Avengers: The Age of Ultron (2015). At E3 (2015) we could prove it, and the truth is that at first glance difficult to differentiate the game that launched a couple of years ago, looks like you're playing the same thing again, only with slightly different situations. If you notice that this time, being focused only on films The Avengers and not cover the entire universe of Marvel characters are pampered, with more emphasis on the skills and powers that set them apart, and his personality perfectly recreated through the classic humor that print their games TT Games. The demo began near the end of the first film, with a battle atop the Stark Tower. After a fun and spectacular kinematics, we control passed to Thor and we had to face Loki and his army of villains in a kind of boss. The combat with the hammer and returning energy balls throwing the villain, mingled with the usual puzzles of the series and some quick time event, seeking to offer spectacular and epic moments in the struggle. Once we had weakened, we had to catch Loki and throw the vacuum, passing control to the Black Widow, who was piloting a ship, in a scene worthy of a shooter or shoot 'em up, one of the novelties of this game. A simple sequence, like all mechanical introducing LEGO games, but very spectacular, having to destroy the army of alien ships Loki around the Stark Tower. After that we spent to fight in the streets of New York, it will be the central city of adventure (as in LEGO Marvel Super Heroes), something that has become common in the past LEGO games, including touches of open world, with all kinds of side missions and collectibles. Here we controlled a trio of characters to exchanging could go as Captain America, Black Widow and Hawkeye. The objective in this area was rescue five New Yorkers in need, and we could do it in the order we wanted. As usual grace is in solving puzzles, rather than on fighting those who are not given any importance, and had to use the unique abilities of each character to resolve situations: Captain America and his shield, which rejects shooting lasers and active mechanisms, Hawkeye and arrows, which we can use to climb as a platform, or to destroy certain structures in their explosive side, and Black Widow which among other things could use a kind of tablet in a simple minigame locating objects through a scanner. Once rescued five survivors Thor joined the group, and eventually so did Iron Man and Hulk, having to move through the streets of New York in full battle, enemies and rebuilding all types of structures, as is customary in the series. As we said before the game is too much like LEGO Marvel Super Heroes, and the interest we see it is if you liked the movie a lot and you feel like reliving the LEGO style. The saga is heavily exploited and innovations rather urgently needed, and it seems that this title will help too, being so similar to the game which was launched two years ago. 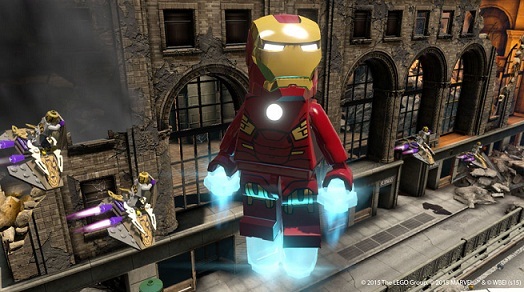 In any case, the formula remains entertaining and very well made, and will be highly recommended for the smallest of the house, which not too many quality games they play precisely LEGO Marvel Avengers will be released this fall on PlayStation 4, PS3, Xbox One, Xbox 360, Wii U, PlayStation Vita and Nintendo 3DS.